WASHINGTON — Congressional leaders reacted with shock and dismay at the sudden resignation announcement of Defense Secretary Jim Mattis on Thursday, with many blasting President Donald Trump’s reckless policies for forcing the popular former general out of office. In a resignation letter released Thursday, Mattis said he will step aside in February so Trump can select a new military leader “whose views are better aligned with yours.” The letter appeared to contradict recent White House decisions to withdraw troops from Syria and Afghanistan, and Trump’s overall views on traditional U.S. alliances. White House press secretary Sarah Sanders downplayed the disagreements in a meeting with reporters Thursday night. “Secretary Mattis has served the country admirably for over four decades,” she said. “He and the president have a good relationship, but sometimes they disagree. The president always listens to the members of his national team, but at the end of the day it’s the president’s decision to make." But both Republicans and Democrats on Capitol Hill called Mattis’ departure a severe blow for the administration and the country. Senate Majority Leader Mitch McConnell, R-Ky., called it “regrettable” that Mattis won’t be in the middle of the White House’s key national security discussions anymore. House minority leader and presumed next House Speaker Nancy Pelosi, D-Calif., said she was “shaken” by the announcement. 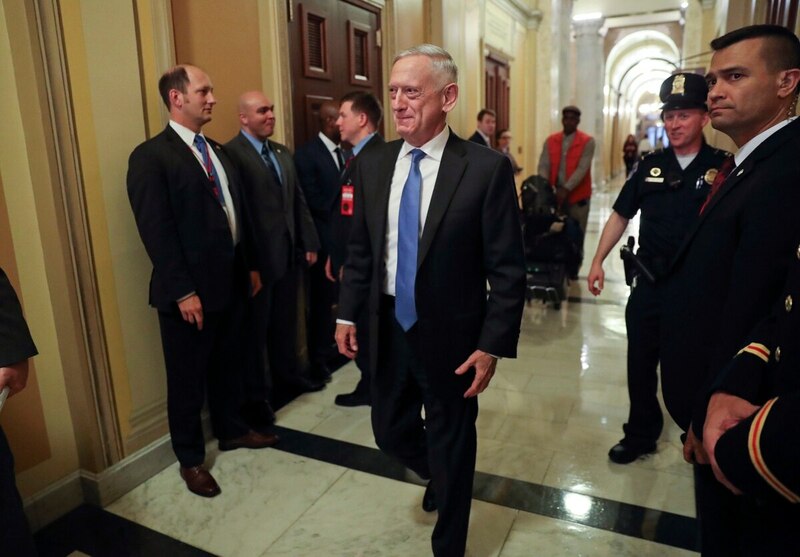 Senate Minority Leader Chuck Schumer, D-N.Y., called Mattis “one of the few symbols of strength and stability in this administration.” Senate Armed Services Committee ranking member Jack Reed, D-R.I., called the resignation a sign of Trump’s misguided defense policies run amok. As @realDonaldTrump drives away the grownups in the room, there is cause for genuine concern. I thank & honor Secretary Mattis for a lifetime of service. Focus on Capitol Hill now turns to who Trump’s pick to replace Mattis may be, and what kind of confirmation fight that nominee will face. Mattis was so highly regarded among lawmakers that they overwhelmingly approved a waiver allowing him to serve in the civilian defense leadership post even though by law his did not have enough time since his military service to be eligible. The Senate confirmed him by a 99-1 vote just hours after Trump was inaugurated.